The MLB regular season is over, and NHL is starting on October 4th. While there will be plenty of short MLB playoff slates, you’re going to want to play some daily sports between NFL slates. This piece is about transitioning from MLB to NHL DFS. In MLB, your pitcher is your rock. You trust pitchers to rack up innings, strikeouts, and wins. They provide points you can count on in a given slate. In NHL, the goalie is the closest we get to a pitcher. The goalie is the most consistent position. Despite having a slightly negative DraftKings Plus/Minus, goalies have historically offered a 47.4 percent Consistency Rating. On the other hand, while they have a slightly positive Plus/Minus skaters have only a 35.5 percent Consistency Rating. Like pitchers accumulating outs and strikeouts, goalies receive points for each save they make. And like pitchers they also get points for wins and shutouts, which means that Vegas odds are important to the position. Also, FanDuel goalies (like pitchers) are eligible for only one roster spot, which means that (like pitchers) they often have concentrated ownership rates. Many people enjoy playing MLB DFS because lineups come out early. You can set your lineups well before lock and once games start you know it is rare to have a late scratch. One of the best parts of NHL DFS is that after a team’s morning skate you typically know the lines and starting goaltenders. By mid-afternoon, all teams that had a morning skate will have their lines set. However, when a team is playing on back-to-back nights you may have to wait for the pre-game skate to get finalized lines. Once you know the lines and have constructed your lineup, you can basically set it and forget it. There are always exceptions to this but rarely are there late scratches or surprises. Many players enjoy NBA DFS because of the constant accumulation of points throughout the game. NHL and MLB are entirely different, as they are event-based sports. In NBA, points tend to accrue fairly regularly. In NHL and MLB, you could look at your DraftKings and FanDuel apps for 20 minutes without accumulating any points and then suddenly be at the top of the leaderboard with one goal or home run. If you played MLB this season, you are accustomed to this kind of scoring and the different sweat that comes with it. NHL is similar in that a late goal can change your night in the blink of an eye. It takes a different sort of mentality to handle this sweat. You have to be OK with massive volatility. In guaranteed prize pools, stacking is king in both MLB and NHL DFS. You will have an extremely difficult time winning GPPs if you’re not stacking. In MLB, there’s a lot upside to stacking, as teammates in the same lineup do not need to compete for the ball the way that hockey players compete for the puck. As a result, the upside of stacking and correlated scoring in MLB is immense. If you stack four or five batters who start to rally, you are going to pick up hits, runs, and runs batted in quickly. The NHL has correlated scoring in that if you stack linemates and one player scores then you have a good chance to pick up an assist from one or more of his linemates. While the upside isn’t as great as it is in MLB, stacking in NHL still maximizes your potential production. You can stack a line that plays together at even strength (5-on-5) or you can stack a team’s power play (5-on-4). If you’re an MLB DFS player, NHL will feel familiar even if you’re just getting into it: The scoring, sweat, and strategies are all similar. Knowing this before you begin, rather than learning along the way, should help you with the transition. 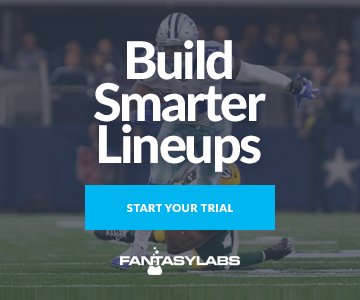 Once the season starts, be sure to use our Models to research and create lineups.